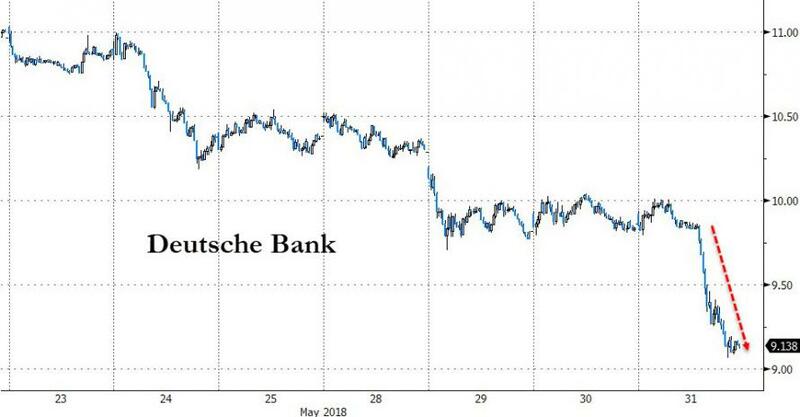 It was already a terrible week for Germany's largest bank, when the Italian turmoil sent its stock price below €10 for the first time since the bank's existential crisis in the fall of 2016, and it just got worse this morning, following reports that the Federal Reserve has designated Deutsche Bank U.S. operations to be "troubled condition" which the WSJ said was a rare censure for a major financial institution and is being reflected in its price this morning, which is now down over 5%, at €9.35, and rapidly approaching the all time low of €8.834 hit in September 2016 when speculation was rife that Germany would bail out Europe's largest lender. As the WSJ reports, the Fed’s downgrade took place "secretly" about a year ago, and hasn’t been previously made public until today. The “troubled condition” status—one of the lowest designations employed by the Fed—has influenced moves by the bank to reduce risk-taking in areas like trading and lending to customers. 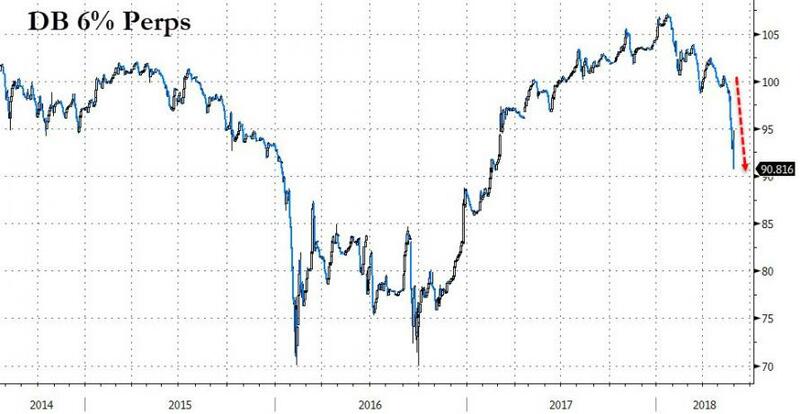 Some additional details on the Fed's secret rating system known as "CAMELS"
The U.S. system for rating banks is called “CAMELS,” which stands for capital adequacy, asset quality, management, earnings, liquidity, and sensitivity to market risk. A bank’s topline rating, from 1 to 5, takes into account all those categories. The best rating is “1.” Troubled banks are rated either “4” or “5.” Scores aren’t made public. While hardly a surprise for the recidivist criminal bank, the Fed's special designation means the bank has had to clear decisions about hiring and firing senior U.S. managers with Fed overseers. Even reassigning job duties and making severance payments for certain employees require Fed approval, the WSJ sources said. This unprecedented scrutiny of DB by the Fed, which comes at a time of great turmoil for the bank whose CEO was recently expelled and which has seen many of its top traders and bankers quietly quit or get poached, has rippled through Deutsche Bank’s relationships with other regulators, including the FDIC., which has pressured the lender to improve controls and oversight. 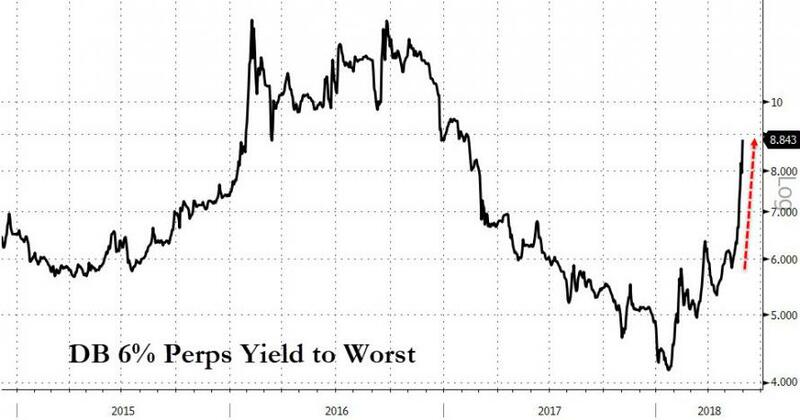 The Fed downgrade also landed the bank’s FDIC-insured subsidiary, Deutsche Bank Trust Company Americas, on the FDIC’s “Problem Banks” list of at-risk institutions. The FDIC doesn’t detail the membership of the list, but does say how many banks are on it and the combined value of their assets. 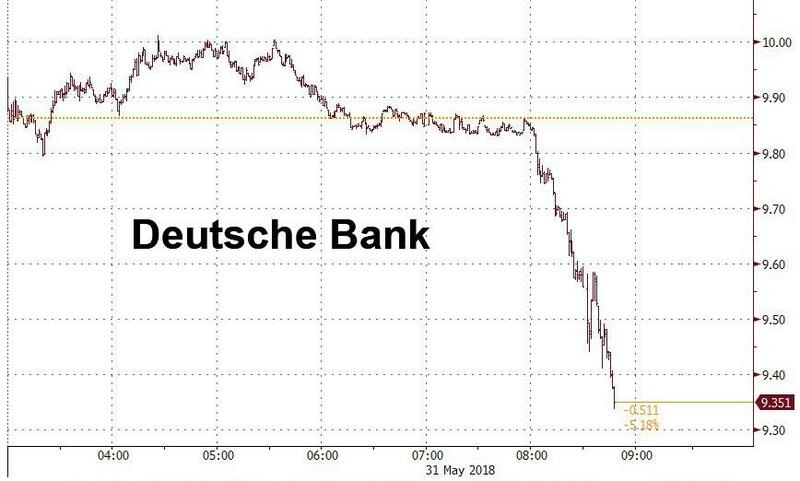 The list’s asset total rose by $42.5 billion in the first quarter; Deutsche Bank Trust Company Americas, the bank’s well-capitalized American deposit-taking unit, had $42.1 billion in assets as of March 31, according to regulatory filings. She also noted that “we have previously indicated that our regulators have identified various areas for improvement relating to our control environment and infrastructure. We are highly focused on addressing identified weaknesses in our U.S. operations." 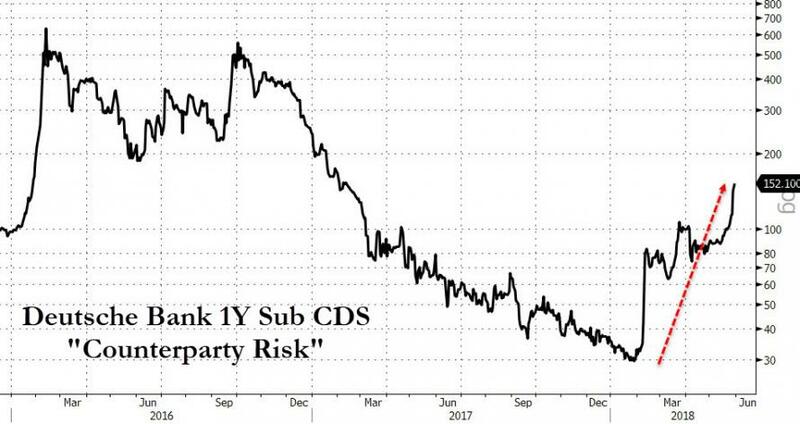 ... the market disagrees, and in addition to liquidating DB stock has sent the German bank's 1Y Subordinated CDS, i.e, its "counterparty risk" soaring, if still well off its 2016 highs.